Green slender leaves similar to, but thinner than, garden green onions. Grows faster and taller than the surrounding grass. Has a strong onion/garlic smell when cut or mowed. Grows in patches and spreads by seed. Garlic also spreads by underground bulblets. Seen in greats amounts in early spring. Wild onion and wild garlic are common perennial grass-like weeds found in many home lawns. They are the wild cousins of the garden variety we use in salads and for cooking. Just like the store bought or home grown variety, these wild cousins are also edible. Caution: However, I would use caution about eating anything that is growing in your lawn, especially if any chemicals were applied. But many people do eat them. Once these weeds are established in your lawn, they spread rapidly and can seriously detract from the lawn’s beauty. Wild garlic and wild onion are easy to identify. They are cool season perennials, meaning they will be actively growing in the cooler parts of the year. They grow equally well in shade as full sun. As the weather warms in late spring, the bulbs will go dormant. Their rapid growth makes them easier to spot. 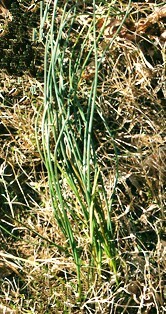 It is not uncommon to see the onion and garlic standing 6 to 12 inches taller than the rest of the grass. When you mow the lawn, there is no mistaking the strong onion/garlic smell released when cut with the mower blades. The larger the patch, the more noticeable the odor. Like nutsedge, wild garlic and wild onion grow in patches. Both species will produce flowers and seed, which fall to the ground and germinate. However, wild garlic can also spread by producing bulblets. These bulblets become new plants, thickening the patch. Frequent mowing will slow the spread, because the plants will not have sufficient time to flower and go to seed. The leaves of wild garlic and wild onion are the parts of the plant that most people see. They look similar to green onions you buy in the store, except the blades have a much smaller diameter. They are generally only a quarter to an eighth the diameter of garden green onions. Distinguishing between wild onion and wild garlic is difficult due to their similar appearance. Wild onions have a flat blade, while wild garlic has a rounded blade. When you break the blade in half, wild garlic will be hallow, while wild onion will appear more solid. Some have noticed in their area that wild garlic seems to have an onion smell, while wild onion has more of a garlic smell. If they didn’t misidentify the species, then smell may not be an accurate means of identifying each one. If you wish further identification, you must dig up the bulbs. You will notice that wild onion blades are divided at the base near the bulb, but wild garlic divides further up the stem. 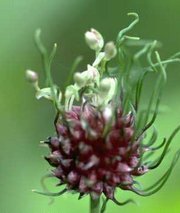 The bulbs of wild onion have a reticulated membrane (net-like covering) around the bulb and wild garlic does not. A thick, well maintained lawn provides excellent weed control against these and most other weeds. If your lawn is thin, it may be necessary to aerate and over-seed cool season turf annually or semi-annually. Also, very thin warm season turf may require plugging, sprigging, or over-seeding (for seeded varieties) to develop the thickness required to keep out many weeds. Keep in mind that dormant warm season grasses can become quite weedy until they break dormancy. For excellent information on maintaining a thick lawn, refer to the Grass Types page. You can also benefit from reading the Photosynthesis -The Key to Understanding Grass Growth page and the Lawn Fertilizers and Fertilization Pages. Attempting to pull them up by hand is not recommended because the blades snap off easily and the plants will grow back. If you prefer to dig them up, you will need to be sure to get all of the bulb, bulblets and root system. Mowing will slow their progress. If you have a grass type that requires frequent, low mowing, then the numbers may eventually decline. This is because wild onion and wild garlic need a certain amount of blade for sufficient photosynthesis. However, do not mow your grass below the lowest recommended height or your grass may decline and other lawn weeds will take advantage of that. Since these plants are perennials, there are no preemergent herbicides that will work against onion and garlic. However, several post-emergent herbicides are labeled for wild garlic/wild onion control. Look for triple herbicide formulations (formulations containing three different herbicides) with at least 2,4-D and Dicamba. Also MCPP, Clopyralid, triclopyr will work. If it is not already in the formulation, (check the label) you can purchase a small bottle of “sticker/spreader” and add the amount listed on the label. It will coincide with the amount of solution you prepared. Just add the required amount directly into the sprayer while adding the other ingredients. If you have a “ready to use” (RTU) product, then add the sticker to that. The reason is that many weeds have a waxy surface and a sticker will allow the herbicide to stick to the plant and not roll off. The spreader causes the herbicide to flow out evenly over the surface of the plant. The addition, a sticker/spreader may aid in absorption providing better weed control. Always read the label completely before opening the container and follow all the label instructions. For a better understanding of herbicide safety, please read the Using Herbicide Safely page. Crabgrass and Foxtails are two major annual weeds that can cover your lawn. You will find detailed information on their growth habits and how to stop them before they even start. With each spring comes a surge of winter annual weeds. Here you will find valuable information about these difficult weeds including growth habits, photos, and measures that can be taken to control them. Many of the most problematic lawn weeds are annuals. Here you will find specific summer annual weed information, with weed names, photos and control methods. Click here for weed identification and control of common perennial lawn weeds. This page has detailed information on Canada Thistle, Mouseear Chickweed, White clover, Dandelion, Field Bindweed, Ground Ivy, and Common Mallow. Click here for perennial weed identification and control. You can find detailed information on Buckhorn Plantain, Broadleaf Plantain, Red Sorrel, Wild Violets, and Common Yarrow. Nutsedge is a summer perennial grass-like weed. They can be particular problematic since they cannot be controlled by broadleaf weed herbicides. Click here for weed identification, growth habits and control methods.